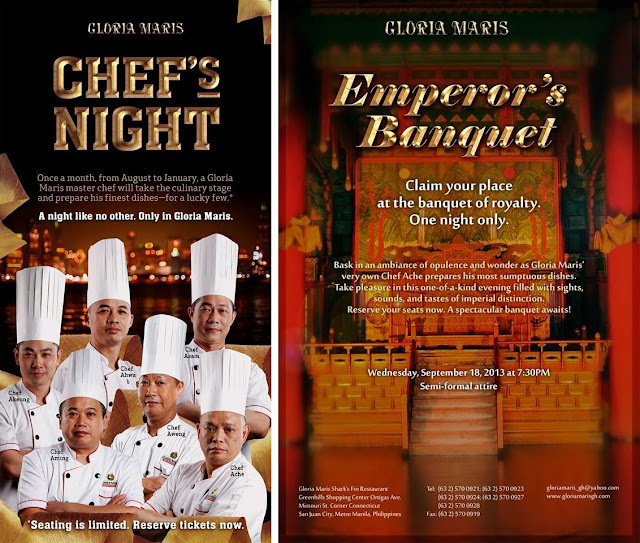 Gloria Maris Shark's Fin Restaurant presents "Chef's Night"- a dinner banquet of sumptuous dishes especially prepared by Gloria Maris' master chefs. Each month, one chef will prepare his finest creations for a lucky few to sample. This will run for 6 months from August to January. 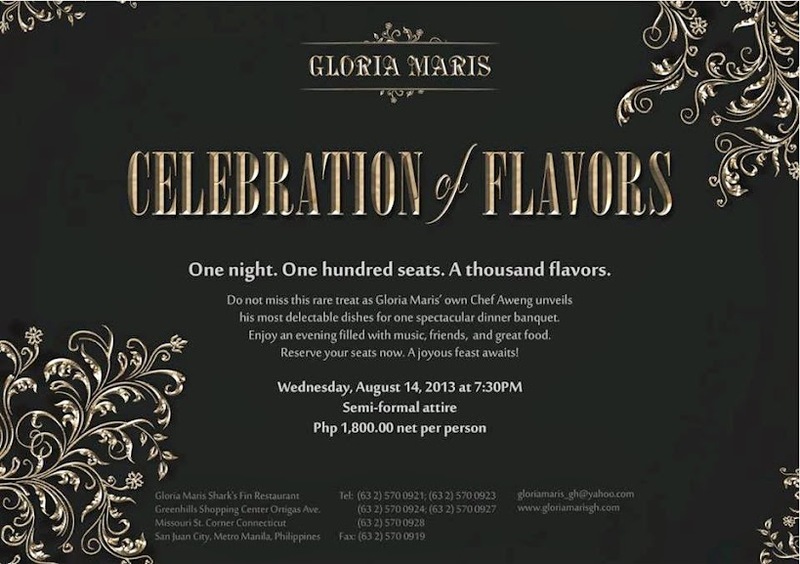 Gracing the first month held last August 14, was Chef Aweng's Celebration of Flavors. A night filled with music, friends and food that showcased his flavorful dishes with a creative and modern flair. Starting with a crispy Spring Roll Stuffed with Vegetable and Garlic served in a wine glass. More like a shrimp roll with its generous fillings of shrimp. Followed by a fresh ensemble of Scallop Salad served with Fish Roe, Corn, Asparagus, Melon and Kiwi with Salad Dressing. It was definitely a plate of colors and flavors. A light and refreshing Superior Soup with Wintermelon, Prawns, Crabmeat and Shark's Fin to warm the tummies as it builds up the anticipation. A heaping of Hand Shredded White Chicken w/ Sesame Seeds and Coriander was more than enough to fill my appetite. It was very tender, aromatic and flavorful as I dug into the pile. Sesame Buchi w/ Creamy Almond Filling topped with Crisp Cookie - Chef Aweng added a unique twist to the classic sesame buchi by filling it up with some creamy almond filling. Want to experience Gloria Maris Shark's Fin Restaurant on a whole new level? Then buy your tickets now for the next "Chef's Night" happening on September 18 (7:30pm-Wednesday), featuring Chef Ache's "Emperor's Banquet". Hurry as seating is limited and the event will only accommodate 200 diners to take part in this royal and glorious banquet fit for a king.